The Thor Agena B with Discoverer 37 on the launch pad Jan. 13, 1962. Imagine seeing the remains of a rocket launch from 50 years ago, as a fossil of spaceflight history in orbit. That is what the following pictures are about. I was intrigued by the fact that the technique used to photograph this object wasn’t actually available at the time of launch. 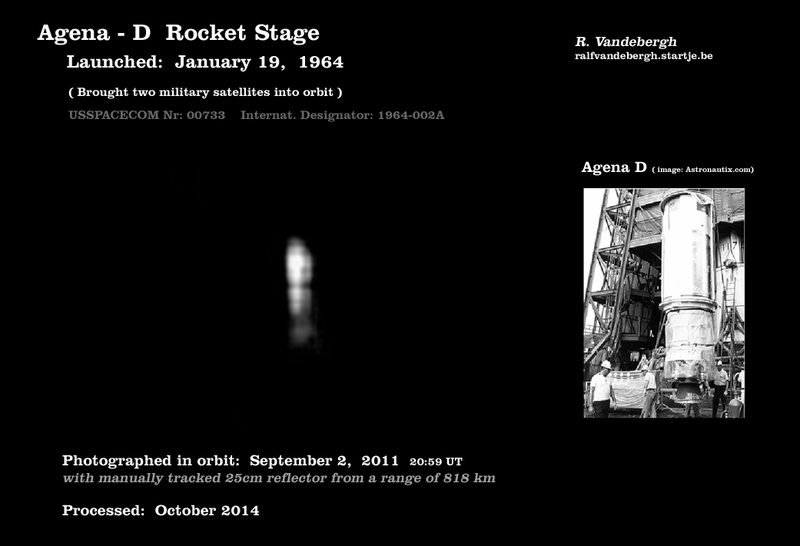 The Agena-D rocket upper stage is best known from the Gemini-era as the Agena Target Vehicle (ATV). In 1966, Neil Armstrong and David Scott performed the first ever docking of two spacecraft in orbit with Gemini-8 and the Agena. 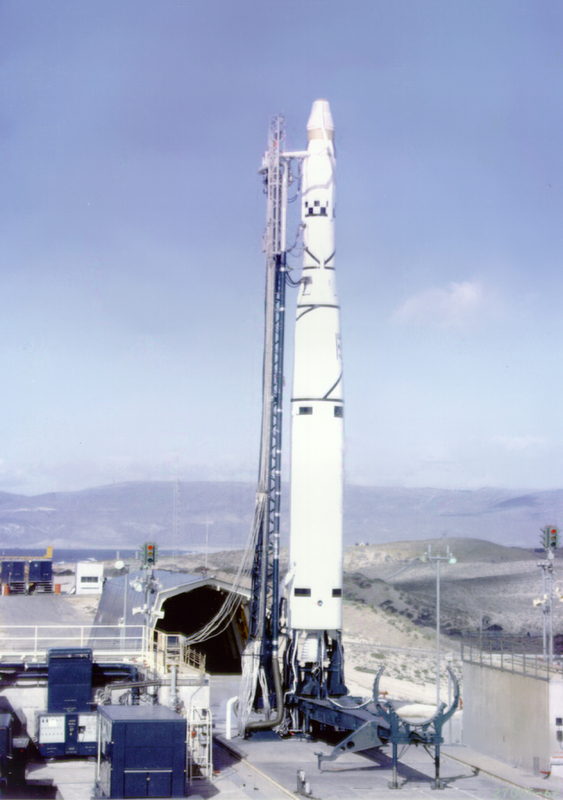 The Agena rocket in the picture is pretty much the same type as used for the Gemini flights but without the docking adapter and in its original configuration. On January 19, 1964, a Thor Agena D SLV-2 rocket lifted up from the Vandenberg SLC2W complex with the two military satellites OPS 3367A and OPS 3367B. Their purpose was probably to test military spaceflight technology. The two satellites were released at an alititude of around 800 kilometers. Exactly at that altitude we find the old spent Agena upper stage from this launch. Thanks to the considerable altitude, it is still in orbit after 50 years. I captured the Agena in September 2011 with a 10 inch reflecting telescope on video. Over the years I have developed better techniques and I knew in 2011 that my processing technique was developing and making progress. It wasn’t until October 2014 that I processed these three year old images of 50 year old rockets. It is not an easy object to photograph: brightness was at the limit for high-resolution imaging with my setup and an upper stage at 818 kilometers distance is pretty small. But the Agena is a pretty long shaped rocket stage, so I hoped to see at least the elongated appearance. To my surprise, the best frames clearly showed the shape and even more. Even differences in thickness of the Agena can be recognized clearly from that distance. The image above is the best from the video-sequence. 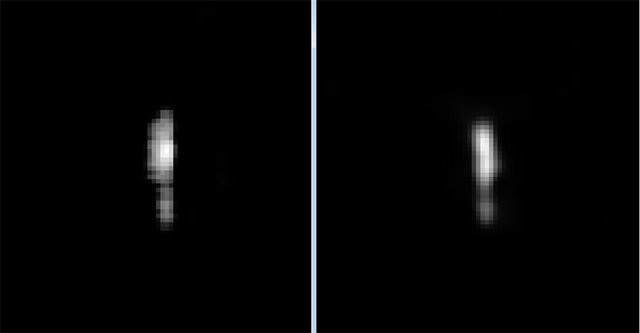 To illustrate how average images of this sequence look, I also have added another set that shows roughly the same detail, such as thicker upper-end and some albedo variations. I still have many unprocessed images to go.